When did the word “emoji” start to be used in place of “smiley faces” in English? I was amazed to hear a non Japanese speaking friend use the word emoji when talking about the graphics while texting on their phone, I asked them if they knew what emoji meant to which their reply was “I don’t know, that’s just what they’re called.” They had no idea it was even a Japanese word! Emoji was originally only available in Japan, but now has been adopted into other countries and thus the term was coined. Emoji or 絵文字 （えもじ） means “picture letters”, early forms of this started out with text alone as 顔文字　（かおもじ） or “face letters” or Kaomoji. An example of popular American 顔文字 is 🙂 while ^^ is typically used instead in Japan. English speakers are pretty bland when it comes to 顔文字, I would say there is only a short list of commonly used ones. Adding a dash for a nose doesn’t count as an extra! Beyond that list, I can’t really think of many more that are used. 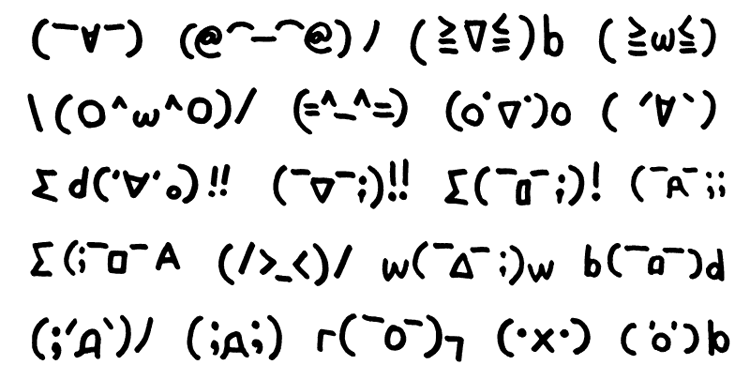 If you really want to go overboard on kaomoji, you can check out: http://www.kaomoji.com/kao/text/, which has so many kaomoji I almost start to not care anymore. If you’ve used emoji before, you may notice a lot of them are Japanese specific since they were first created there. I have my device in Japanese, so it wasn’t odd to me to see them, I assumed it was due to the language setting so it was interesting to see the same emoji on non-Japanese devices as well. What other kaomoji or emoji have you seen? Leave them in the comments!